Electrocoating technology is usually described in a vague manner. That's just the way experts think. They describe the electrical charge, the vat full of paint, and the post-process rinse tank. What if someone needs more details? In that case, clarification is required. How does the process really work? Well, it all begins with the pretreatment room, a series of operations that assures the establishment of a paint-attracting electrical charge. Just like any other electrically assisted coating system, the part in question must be prepped. 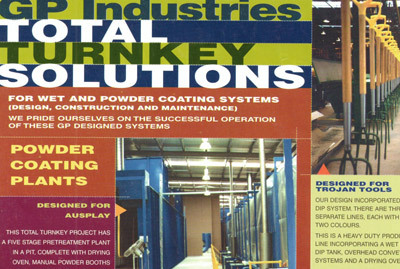 Conductivity-hampering dirt is chemically and mechanically stripped away during this pretreatment phase. Only after the oil, dirt, and other contaminants are gone can the denuded part proceed. All that's left now is the application of a conversion coating. Applied as an iron phosphate or zinc phosphate base, this primer protects the now exposed metal from corrosion and ensures maximum paint uptake. 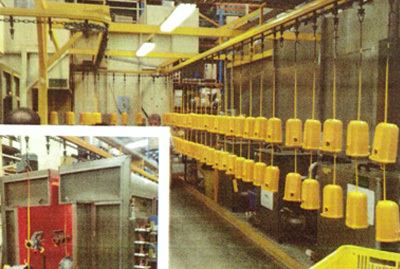 A programmable hoist system conveys the parts. They're flying through the production line towards their drop point. Look closer, the parts are packed in bulk transport systems or racking equipment, all the better to assure a productive operation. A DC rectifier is regulating the circuit. It turns the parts into a cathode and the paint into an anode. Alternatively, the paint is charged negatively while the parts act as the circuit cathode. Lowered into the paint bath, the pigmented fluid electrodeposits on each and every part surface. Before the paint-covered component moves onto the curing oven, it must be rinsed. The rinse phase washes away undeposited material so that the aesthetically trimmed part's coating is finished in a skin-tight film. Past the rinse station, the component moves into a large oven. Crosslinked and baked in place, the uniformly distributed, electrically deposited coating hardens into a durable shell. The three or four stage process terminates in that curing oven, with the entire bake finishing in under twenty minutes. All of these primary stages break down into numerous substages. There are different phosphates and cleaning techniques in the prep stage. Then, in the coatings tanks, the DC rectifier varies its output. The paint coating thickens as the charge increases. 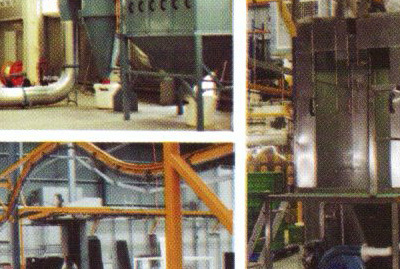 There are acrylic-based mediums and epoxy-based substitutes in those tanks. They flip polarity, gain different, more advanced fluid formulas, and the resulting finishes take on incredibly diverse material properties. Electrocoating technology, a paint depositing process, adds a durable, near VOC free (Volatile Organic Compounds) finish to large and small metal parts.